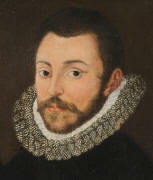 1559 at the examination at Preston concerning his death, "John Rawlenson of Furness ffels said that William Sandes was murdered on account of certain Tythe corns which were in his possession, and which the sons and servants of William Bardsye, Esq., attempted to carry away. The sons were Nicholas and Robert, and the name of the servant was John Trogheton; but this deponent did not know who gave the mortal blow." Another witness affirmed that "there were about 50 men and women present at the murder," and stated that William Bardseye bore malice against William Sandes on account of a privy seal delivered to him by the latter for concealing a piece of land from the Queen. Bardsye subsequently fled to Scotland, where he lived secretly till he could obtain the Queen's pardon. 1572 . . . "Sandys seems to have been one of the most active parliamentarians on the episcopal bench. In particular, he was in the van of the campaign to bring Mary, queen of Scots, to book. In a letter to Cecil he called her the root of England’s troubles and he was one of the first to demand her head." "Although Sandys is not known to history as a resistance theorist, it is significant that he had called Mary Tudor ‘Bloody Mary’, an expression usually said to have been invented in the nineteenth century" . . .
"That combination of expediency and graft which has come to be called sleaze might appear to sound an appropriate note on which to end the life of an archbishop who has gone down in history as a model of grasping episcopal nepotism." "But it has to be said that by the end of the twentieth century Sandys had never attracted a biographer equipped to find and make a case for his rehabilitation." by 1564 / c. 1587 j.p.q. Worcs. 1583 commr. musters, recusancy, Bucks. 1586 commr. musters, recusancy, Bucks. He was confident of his salvation by ‘free grace’ and the merits of Christ, and trusted that he would be received ‘to dwell among the souls of God’s elect’. He was to be buried without ‘vain pomp, ostentation or chargeable funeral’. He bade his eldest son, Edwin, be kind to the widow and ‘travail in her causes’, as he had travailed in Edwin’s ‘most troublesome and tedious causes’; the widow was bidden, in her turn, to be kind to the children, and God, ‘the father of the fatherless orphans’, would bless her. bur. Latimer Sandys (1930), citing Inq. p.m. Bedford 44 Eliz. This page was last revised on 2019-03-30.